Back 40 Mercantile, located at 264 South Beach Ave in Old Greenwich, hits home on so many levels. And you can tell the moment you step inside! Based on the idea of an old general store, Back 40 Mercantile has a distinct modern look and a dedication to local artisans and sustainable goods. The entire space is meant to create a shopping experience for all five senses. From an abundance of textures to the pleasant smell of scented candles and lotions, it’s a beautiful experience.. and yes, every time I’ve gone in, they remember that I’ve shopped there before. Which brings me to the reason behind this post. Katrina Bischoff, Back 40 Mercantile Co-Founder and Store Manager/Chief Stylist. 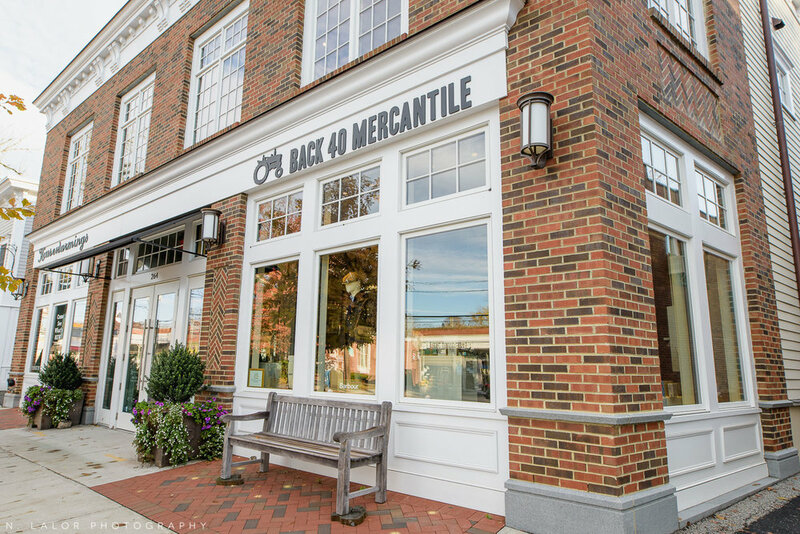 Back 40 Mercantile is one of my go-to, absolutely favorite stores for holiday shopping! It’s also the first place I visit for birthday gifts, but this time of year, Christmas is really right around the corner! The reason why this particular store works so well is because they have just about everything.. and when you’re shopping for hard-to-choose-for family members, that makes all the difference. I’ve combined items from different sections of the store to create a gift basket of sorts - items that go together and perfectly fit the recipient’s personality. And the best part, Back 40 Mercantile will gift wrap free of charge using the most beautiful wrapping paper, ribbons, and embellishments (like frosted pine cones with sleigh bells). That personal attention to detail and the fact that I don’t have to spend hours wrapping gifts is absolutely priceless this time of year! The photos below will give you a pretty good idea of the types of items you will find at Back 40 Mercantile.. but nothing beats being there in person. There’s a whole Barbour section for men and many beautiful silk and cashmere things for women.. not to mention gorgeous hand-made jewelry and truly unique items for the home (like local honey from Old Greenwich bees!). There’s a huge baby section and lots of toys, too, since we all know that Greenwich is full of families with young kids! So if you haven’t been yet, GO, and make your holiday shopping a little easier and more enjoyable this year! Sound Beach Avenue has a lot of super cute stores and restaurants, and Back 40 Mercantile is not to be missed!